What would a world be like with no Kleenex? I once served as a short-term worker at a bible training center in Eastern Europe. Haus Edelweiss acts as a hub for providing on-site-classes and for sending professors to local areas to accommodate students in more restricted countries. One couple was able to work out their schedule so that the wife served with me at the Haus, cleaning and cooking for the students in residence while her husband went to Moldova to lead a week long training course there. On our end, I got a reality check of what life was like for students coming from Eastern Europe and Central Asia. They were used to having the bare necessities and some luxuries but often lacked the variety and choices we enjoy in the States. Even countries like Austria don’t have available what we would consider essentials or everyday items – like Ibuprofen, marshmallows, and Jell-O. Something so cheap, so available, so – necessary. Kleenex was the next best invention to sliced bread. My Western mentality tried to wrap my brain about living in a culture where one must launder handkerchiefs and rags to deal with sinus issues, colds, and tears. Years later, I realized Moldova wasn’t the only place with no Kleenex. Recently I’ve taught the book of Revelation to a women’s Bible study. To close out the series, I planned a “Wedding Feast of the Lamb” for our final session. I arranged tables in our church building’s prettiest location, the front entryway, set the tables with gold colored paper plates, and prepared an elegant salad luncheon, ending with wedding cake. As I tidied the foyer, picking up loose papers and centering flower arrangements. I came across a Kleenex box on an end table. It seemed oddly out of place, but I rationalized that someone might need it. Still, I felt unsettled about its presence, choosing to hide it behind a flower vase. Then I realized why it seemed like it didn’t belong. There will be no Kleenex in Heaven. Because there will be no tears in Heaven. 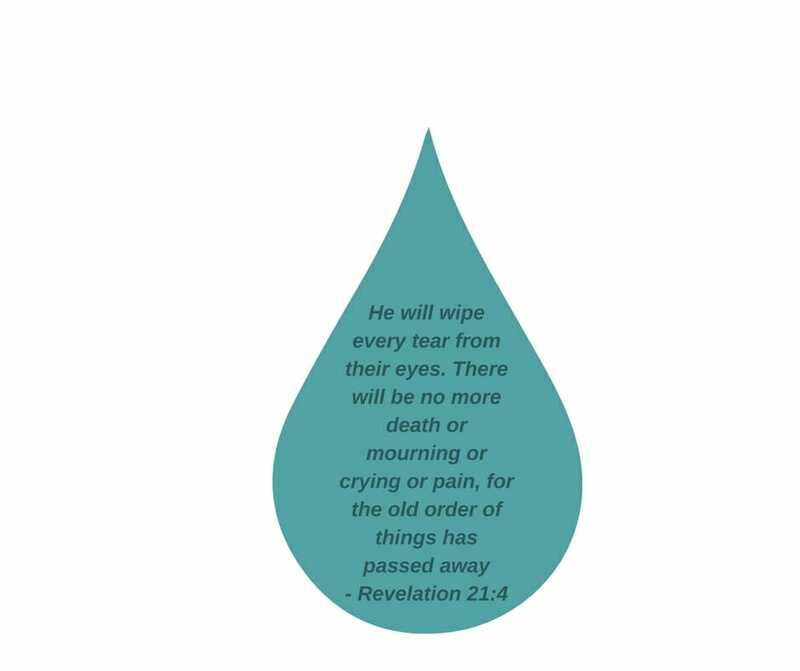 Over the years of my Christian life, I’ve pondered that part about Jesus wiping the tears from our eyes. Why will there be no tears in Heaven? Why do we shed tears? All of these are symptoms or effects of sin. Before God establishes His new Heaven and new Earth, He will eradicate all evil and all those who cause and perpetuate wickedness. The evil, violence, poor life choices, and overall world corrosion that leads to death will happen no more. Think about it. Even happy tears often come from relief that a bad situation has been resolved. No more bad situations. God knows why you’re crying and what caused you to cry. He knows and He cares. He cares so much that He plans to do something about the things that make you cry. One day, all of those things will be gone forever. What other items WON”T be in Heaven because we won’t need them? Share in the comments below. How awesome! Thanks for sharing! My time working at Haus Edelweiss was truly an Eye opener as well. I wished I had packed more marshmallows, as some people had never tasted them before & loved’em. I am so thankful we won’t need any kleenex in Heaven!! Paula, did you all make the Oreo Cookie dessert while you were there? Did you bring any packages of Oreos for that? Oh what wonderful memories. Haus Edelweiss was a life changer! I learned so many lessons from my work there. Yes, your Aunt Katherine said we needed to take A LOT of Oreo Cookies and so we did. When we got there……I knew why! Yum yum!! In fact I believe I have a picture of Katherine mixing that dessert in a very large bowl. I have written a couple of little short stories about my heart warming time at the Haus. I definitely returned home with much more than I left with! What a blessing!